Juan Mata has leapt to the defence of his Chelsea team-mate Fernando Torres after he was criticised for not scoring again for Spain. The misfiring striker has already been reassured of his place by coach Vicente Del Bosque, who is set to keep faith with the Blues hitman for their final Euro 2012 qualifier against Scotland tomorrow in Alicante. Torres hasn’t found the back of the net for his country since June when he struck in a 4-0 friendly win over the USA. Prior to that, his last goal for Vicente del Bosque’s side came in September 2010, when he scored a double in a 4-0 Euro 2012 qualifying win over Liechtenstein. Mata and his old Liverpool club-mate Xabi Alonso scored the goals for the World Champions on Friday night as they put two past Petr Cech’s Czech Republic without reply in their Group I encounter at the Generali Arena. 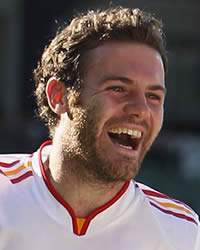 “I live with Torres on a daily basis and he is really eager to score for both Chelsea and Spain,” Mata told AS.com. The £50m man also received words of encouragement from Del Bosque, who is now planning to rotate his players for the match against the Scots, having already clinched top spot. He added: “I saw Fernando in good form with a lot of energy and enthusiasm.